One of the trips I am taking this summer will be to New Mexico for the annual board meeting for Cuyamungue Institute. I usually conduct a workshop while there, but this year we have a special event, The Centennial Celebration. This is year, Felicitas Goodman, the founder of Cuyamungue Institute, would have been 100 years old. We have people coming from around the world to spend a week on the beautiful land, and share our experiences with Felicitas. Last year at the board meeting I volunteered to create a slide show of Felicitas. I have created a few of these, so felt confident that I would be able to do this. And...it sure beat taking charge of registration and coordinating transportation and lodging. In August I sent an email to friends, students and colleagues of Felicitas asking for pictures. Two people responded...one with no pictures and one with one picture. It was a bit of a slow start...but I had months to finish this...so no worry. I sent another email and Belinda (past president of Cuyamungue Institute and now Director of Instruction) told me she had quite a few pictures. We met for lunch. I thought she would hand over an envelope full of pictures, but instead had a big box full of journals. than what it looks like. out of the plastic bags for a better picture. Felicitas had taped pictures scattered through the pages of her journals. Some day I will write a post about Felicitas, because she was an amazing smart and interesting woman. 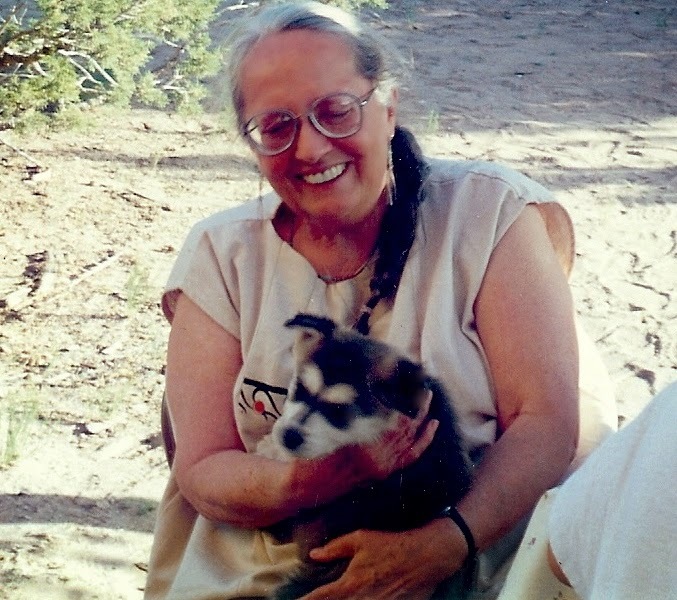 She was a scientist, anthropologist, linguist, prolific author, and teacher. She kept intricate records in her research and personal life. These journals are written in German...and since I have been studying German for the last few months I have found it fascinating that I can actually read part (a small part) of her journals. This motivates me to keep on studying. Here is a page from one of her journals....written in German. The pages are tissue thin. But the purpose of this post was not to talk about Felicitas or Cuyamungue....it was to tell about creating this slide show. First, I went through each page of her journal and scanned each picture that could possibly be one for the slide show....well, I thought I had. When my sister was visiting last month, I showed her the journals and she just happened to open one to a page with a picture I had not found. So...I knew I had to go through each journal again. From the pictures, you can see how fragile the journals are...especially the ones from the 1930s. I did all of the scanning using the PC in my office. The pictures were sent to my blog folder...I was going to correct that, but had already sent some there so decided to send all of the scanned photos to the blog folder of pictures...and then move all of these to a newly created Felicitas folder. That would keep things neat and tidy. Next, I used Picasa to edit the photos. Many of them were poor quality and so I discarded those into a back up folder to use in case I needed more pictures. After editing the pictures I exported them to a new folder called Felicitas Goodman. I was feeling pretty good with my progress until last night when I decided to work on it from my laptop. We were watching something on television...and I usually watch television from the corner of my eye while working on my laptop or reading. I knew that I had to move all of my work from my PC in my office to my laptop. I have done this many times when working on the blog...starting it on my PC and finishing it on my laptop. Transferring pictures was not difficult once Ray set up a short cut to the PC over our home network. I went through the process of transferring the pictures. I needed more pictures from her later years and found some on line. So I copy and pasted a number of those and labeled them 'Felicitas German' since these were from the German website. Now...to begin the slide show. I typed 'Felicitas' in the search box. There was suspenseful music emitting from the television so my eyes glanced to see that action. Back to the computer screen...horror...no items found! That could not be! I searched again, and again...and growled. Ray, my computer guru, offered help, but I was determined to solve this mystery. My growls became guttural as I blamed the computer for losing my pictures. Ray suggested that maybe I had not transferred them right! What could he be thinking! I have done this many times and I knew the computer was at fault. There was that small doubt creeping out...but I stubbornly shoved it down. I transferred the pictures again with a new name, 'Felicitas1' and did another search. Still nothing. I finally gave in and had Ray check it. After about a minute he found that I had been doing all of the transferring back to the PC...or something like that. I have no idea how I did that. Ray 'fixed' the problem, and named the folder 'FelicitasSpider'( because my laptop is named Spider). He clicked search and got the same thing I had...nothing. Part of me smiled...it wasn't just me...even the guru is having problems. Of course, he had other ways of searching and was able to find the proper folder....and a few other folders and pictures...and lots of duplicates and triplets. How did so many get on there? It was like checking the 'save' key and my pictures became a game of billiards...scattering in all directions...but these not only scattered...they hid from me. There was still a mystery though...and I feared Ray would spend the rest of the evening trying to solve it. He found more Felicitas folders....and I know that my PC has even more pictures and folders and duplicates. Oh my...what happened to my neat and tidy process? We decided to turn off the computers and enjoy the rest of the evening...but I know, that when I am out of town for the next few days...Sherlock Hoy will be dissecting 'my pictures' on Spider hoping to solve the mystery. Aren't computers wonderful. I sometimes think they are like cats...they know where they put things but won't tell you. However, it sounds like your computer was acting more like a rabbit...multiplying things. Glad you were able to find your pictures. Good luck creating your slide show. Wow. Well, at least they are in the computer even if they have been hijacked by computer gremlins. You are lucky to have Ray. You made me a little nervous, I held my breath until I knew all your scanning was safe. What a treasure trove those journals are! Good luck with your slide show.